Sewing machine oil is essential when it comes to the maintenance of your sewing machine. No matter how good your sewing machine is, it cannot go on running forever without proper care and frequent maintenance. Like all other mechanical devices, your sewing machine needs lubrication so that the metal parts that are in contact with each other do not wear each other out. Sewing machine oil minimizes friction between different machine elements and therefore ensures that everything is running smoothly. By keeping grind, wear and friction to a minimum, sewing machine oil enables your machine to sew smoothly with minimum noise. With low noise levels, you will be able to work more peacefully. Sewing machine oil is, therefore, a lubricant specifically designed for your sewing machine. You will need to apply sewing machine oil after every 8 hours or so of sewing machine operation. These are the ‘natural’ variety that can be made from ester oils, silicone and jojoba. But being natural does not necessarily make them better. They are not as effective as other oils. Natural sewing machine oils must be used with care; otherwise, your sewing machine may suffer damage. These sewing machine oils are derived from petroleum compounds. These oils have low viscosity (that is, they are ‘thin’ or ‘light’ liquids), are colorless and quite effective. Most sewing machine oils are basically mineral oils. This is an artificial oil variety which can be safely used on painted, rubber and plastic surfaces. In general, synthetic oils tend to be the more expensive alternative to mineral oils. Do not use oils that were not specifically designed for your sewing machine. Don’t be tempted to use cooking oil, motor oil or any similar variety. You might end up damaging your sewing machine if you use such oils. WD-40 and other oils for joints and hinges cannot be used either. 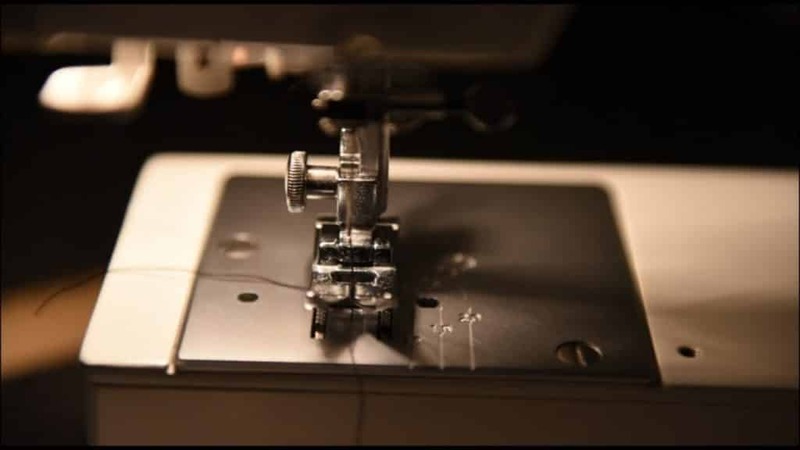 Your sewing machine’s instruction manual will tell you where, when and how to apply the oil. You must never apply oil to your sewing machine while it is connected to the power outlet. Before applying oil, always ensure that you pull out the power cord of your sewing machine form the electrical outlet. This way there is no chance that your sewing machine will accidentally start and injure you. In order to properly lubricate the inner workings, you must first disassemble your sewing machine. Before applying sewing machine oil, you must use a brush or an air compressor to clean up all individual machine parts. This way, you can be sure that there won’t be any lint or dust trapped in your sewing machine which can degrade performance and cause damage. If you have accidentally applied too much oil, there is nothing to worry about. Simply use a rag or towel to wipe away any excess oil. You should not use sewing machine oil if it does not look right. For instance, mineral oils are thin, colorless and odorless. So if your mineral oil looks discolored, smells weird or appears rather thick then you can be sure that it has gone bad. Such oils should be properly disposed of. You should first refer to your instruction material. Each sewing machine is different and will, therefore, have some variances when it comes to applying sewing machine oil. Most manufacturers recommend users to clean their machines after 8 hours of use, but some manufacturers recommend cleaning after 10 hours of use. In older sewing machines, the areas where oil can be applied are marked in red. Sewing machine instruction manuals will show you pictures of parts where you must apply oil. In case your user manual is missing, you can download one from the manufacturer’s website. If it is not available on the website, you should call your local dealer and ask for one. There are some machines that are described as self-lubricating. This will be clearly mentioned in the user manual. You do not need to oil these machines the usual way. But you will still have to maintain them according to the instructions provided in the instruction manual. Before you can apply oil, you must clean your machine. You should switch off your machine and unplug the power cord. To disassemble the sewing machine, you should refer to the drawings in your instruction manual to get an idea of the different parts. There will be detailed instructions for disassembling parts that must be cleaned. Follow these instructions. You should remove all accessories and little parts that can get in the way of cleaning. Make sure that you remove the presser foot, bobbins, and thread. If there is a bobbin hook on your machine, you should remove it as well. Remember to take out the needle before cleaning. Remember to replace any needles since they can also become blunt and less effective. After the accessories have been removed, you can detach the needle plate. Rotate the handwheel towards yourself so that the needle is raised. You can now open the hinged cover at the front. Use the screwdriver that came with the sewing machine to unscrew and needle plate and remove it. You must then follow other instructions specific to your sewing machine to further disassemble the parts. Cleaning can be performed easily with the help of a small lint brush. This is usually provided in the accessories. Use the brush to remove all traces of lint. There may contain some bits of lint that cannot be removed with the brush because they have been compacted. You should use tweezers to pluck them out. Don’t ignore these compacted bits because the cleaning job will then be incomplete. You can use a soft, clean cloth to remove any trace of residue from the bobbin hook. You can also use a can of compressed air to clean your parts if this is more convenient for you. But you will need to be a little careful since the blast of air can blow lint deeper into the machine. To solve this problem, you should hold the can at a distance of 4 inches from the part that must be cleaned. The angle of the airflow should be such that the dust blows away from the machine instead of moving to other parts of the machine. You should place a few layers of newspapers below the sewing machine so that oil does not spill elsewhere. It is also good to place a rag below the presser foot assembly so that your fabric does not get stained by oil. To be on the safe side, before you begin sewing, you should first test the sewing machine by using an expendable piece of cloth. This way, you can ensure that there is no excess oil and that the machine is running smoothly. You should now apply drops of oil on parts as indicated by the user manual. Usually, a few drops of oil must be applied to the housing unit in which the bobbin case is located. In most machines, you must also apply a few drops to the shuttle hook – this is the part that revolves within the bobbin casing. You may also have to apply some drops within the hook race. It may also be required to drop oil on the bobbin hook’s outer ring. You should also refer to your instruction manual to find other points where oil should be applied. One to two drops of oil will be sufficient for most parts. Now that oil has been applied to all parts and all points indicated in the instruction manual, you can put your machine together again. There is no point in applying too much oil. You only need to apply as much oil as is necessary for smooth working. This 4-ounce bottle contains sewing machine oil which is truly all-purpose. It is great for keeping your sewing machine well-oiled and smooth. It is also great for other devices like vacuum cleaners, bicycle gears, typewriters, and other household items and appliances. Not only will it keep metal parts in your sewing machine well lubricated, but it will also prevent them from rusting. Frequent application of this oil will, therefore, ensure that your sewing machine will last for a long time to come. This synthetic oil is very good for sewing machines and sergers. It will allow your sewing machine to run smoothly by minimizing friction in order to extend the life of your machine parts. Your machine will, therefore, operate reliably for many years if you make regular use of this sewing machine oil. The 4 oz. bottle also comes with a spout which makes it very convenient for use. You can now easily apply oil using the spout to all areas that may be hard to reach. Zoom Spout Lily White Lubricant is clear and highly refined mineral oil. This oil is ideal for maintenance of sewing machines since it minimizes friction between metal surfaces in contact with each other. This oil has the correct viscosity which makes it suitable for a wide range of domestic and industrial sewing machines. It will prevent corrosion and surface damage due to wear in your sewing machine. Since the oil is light, clear, colorless, odorless and pure, it is a great choice for sewing machines because it won’t stain textiles even if it inadvertently comes into contact with them. The great thing about the bottle is that it also contains a flexible internal spout that can extend to 7 inches. You can easily use this bottle to apply oil in your sewing machine for places that may not be easily accessible. To use the spout, you will have to aim it at the target area and squeeze the bottle. This rather unusual method of oil application is actually more accurate than the ‘eyedropper’ style bottles which can easily miss the spot and are not ideal for deeper regions. This is the best synthetic oil which can be used to replace paraffin-based oils. It is perfectly safe to use on painted and plastic surfaces and also keeps wear between moving metal parts to a minimum. The bottle also has a medical grade stainless steel needle for easy application. Thanks to the 1.5-inch needle you can now easily reach areas that are hard to access and apply oil accurately. The best thing about all of these oils is that they cost only a few dollars per bottle and each bottle contains a generous amount of oil that can last for a really long time. You can easily maintain your sewing machine and greatly extend its life by using the best inexpensive sewing machine oil.